The Royal Air Force Museum has used virtual reality technology to enable visitors to experience being on board a Lancaster bomber during the Dambusters raid of 1943. The museum worked with the creative technology company All Seeing Eye to create the experience at its north London site. Visitors will be able to go inside a recreation of the interior of a Lancaster and get 360-degree views and audio of the Ruhr dams raid of 1943, Operation Chastise, which was one of the most famous raids of the Second World War and has inspired films and books. Haptic vests will enable visitors to "feel" the window and fuselage while they experience the roar of the Lancaster's Merlin engine during the Dambusters’ first mission on 16 May 1943, attacking the Möhne Dam in Germany. 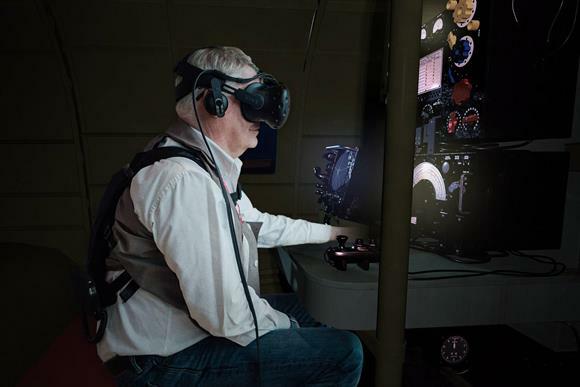 The virtual-reality experience, which costs £10, is the newest part of the Dambusters offer at the RAF Museum London, which also includes a replica of the bouncing bomb, the office used by Barnes Wallis, who invented the bomb, and the original moulds of the first test bombs. Barry Smith, director of visitor and commercial development at the museum, which also operates a public site at Cosford in Shropshire, said the charity wanted to find new ways of interpreting RAF stories. "The opportunity to actually invite our visitors to be part of the Dambusters story is one that we are very excited about," he said. Olie Kay, associate creative director at All Seeing Eye, said: "This experience isn't about explaining all the facts of the mission. It's about exploring the human story of the real people who were on the aircraft and communicating an authentic sense of what it might have been like to be there."